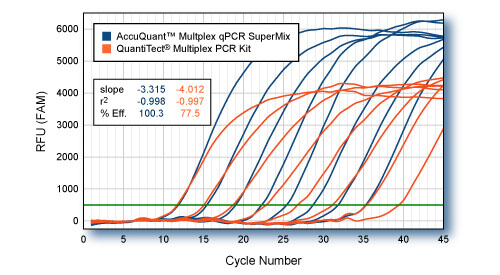 PerfeCTa Multiplex qPCR SuperMix is intended for molecular biology applications. This product is not intended for the diagnosis, prevention or treatment of a disease. PerfeCTa Multiplex qPCR SuperMix is a 2X concentrated, ready-to-use reaction cocktail that contains all the necessary components except: primers, probe(s), and DNA template for highly-multiplexed, real-time quantitative PCR. This reagent formulation pushes the boundary of multiplex qPCR by enabling unbiased amplification of up to 5 targets in a single amplification reaction. Suppression of low abundance targets by high abundance reference targets during co-amplification is a common problem in multiplex PCR in which individual assay sensitivity can be significantly compromised. PerfeCTa Multiplex qPCR SuperMix, Low ROX delivers assay performance with exceptionally broad, linear detection and limit-of-detection (LOD) sensitivity to multiplexed qPCR that is comparable single-plex assay performance without the need for rigorous titration of individual primer assays. A key component of this SuperMix is ultra-pure AccuStart™ hot start Taq DNA polymerase that is completely arrested prior to the initial PCR denaturation step. Upon heat activation at 95°C, the antibodies are rapidly and irreversibly denatured, releasing a fully active high-yielding Taq DNA polymerase mutant. This enables specific and efficient primer extension with the convenience of ambient room-temperature reaction assembly. Varying amounts of GAPD plasmid DNA (10 to 1 x 107 copies) were co-amplified with 1 x 108 copies (each) of beta-actin (ACTB), interleukin-1beta (IL1B), and &#945;-tubulin (TUB). 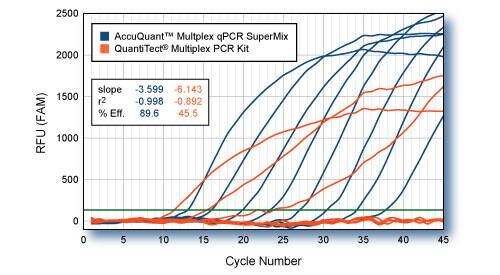 4-color multiplexed qPCRs were carried out in 25-&micro;l volumes with PerfeCTa&trade; Multiplex qPCR SuperMix or QuantiTect&reg; Multiplex PCR Kit (Qiagen). Primer and probe concentrations were according to each manufacturers recommend conditions. Each hot-start Taq was activated according to conditions specified for each product. QuantiTect reagents were incubated for 15 min at 95C, where as PerfeCTa&trade; Multiplex reactions were incubated for 3 min at 95C. All reactions were cycled for 45 cycles of 10s, 95&deg;C, 30s, 60&deg;C. Average of four replicate reactions for each input amount of GAPD plasmid (FAM-labeled probe) are shown. qPCR of ACTB (HEX-labeled probe), IL1B (Texas Red-Labeled probe), and TUB (Cy5-labelled probe) not shown. All probes utilized non-fluorescent Black Hole Quencher&reg; (BioSearch Technologies). Significant degradation of performance with the QuantiTect reagents using abbreviated cycle times is readily apparent. However, recovery of full and unmodified Taq DNA polymerase activity afforded by PerfeCTa&trade; Multiplex qPCR SuperMix enables highly efficient multiplex qPCR even with rapid cycling conditions. Four-color multiplex comparison: extended cycling conditions. Varying amounts of GAPD plasmid DNA (10 to 1 x 107 copies) were co-amplified with 1 x 108 copies (each) of beta-actin (ACTB), interleukin-1beta (IL1B), and &#945;-tubulin (TUB). 4-color multiplexed qPCRs were carried out in 50-&micro;l volumes with PerfeCTa&trade; Multiplex qPCR SuperMix or QuantiTect&reg; Multiplex PCR Kit (Qiagen) according to each manufacturers recommend conditions. Reactions were cycled according to the Qiagen recommended protocol: 15 min, 95&deg;C, followed by 45 cycles of 1 min, 94&deg;C, 1.5 min, 60&deg;C. Average of four replicate reactions for each input amount of GAPD plasmid (FAM-labeled probe) are shown. qPCR of ACTB (HEX-labeled probe), IL1B (Texas Red-Labeled probe), and TUB (Cy5-labelled probe) not shown. All probes utilized non-fluorescent Black Hole Quencher&reg; (BioSearch Technologies). Suppression of GAPD Cts are evident in reactions with the QuantiTect reagents when competing amplicons are >1000-fold excess over the limiting target sequence (GAPD). PerfeCTa&trade; Multiplex qPCR SuperMix accurately amplifies GAPD target in the presences of >1 x 107-fold excess of competing amplicons. Reaction buffer with multiplex qPCR-optimized MgCl2, dATP, dCTP, dGTP, and dTTP. Ultra-pure AccuStart hot start Taq DNA Polymerase. Proprietary performance enhancing additives and stabilizers. Store components in a constant temperature freezer at -25°C to -15°C protected from light upon receipt. Repeated freezing and thawing of the Supermix is not recommended. For lot specific expiry date, refer to package label, Certificate of Analysis or Product Specification Form. Background: Identifying lung pathogens and acute spikes in lung counts remain a challenge in the treatment of patients with cystic fibrosis (CF). Bacteria from the deep lung may be sampled from aerosols produced during coughing. Methods: A new device was used to collect and measure bacteria levels from cough aerosols of patients with CF. Sputum and oral specimens were also collected and measured for comparison. Pseudomonas aeruginosa, Staphylococcus aureus, Klebsiella pneumoniae, and Streptococcus mitis were detected in specimens using Real-Time Polymerase Chain Reaction (RT-PCR) molecular assays. Results: Twenty adult patients with CF and 10 healthy controls participated. CF related bacteria (CFRB) were detected in 13/20 (65%) cough specimens versus 15/15 (100%) sputum specimens. Commensal S. mitis was present in 0/17 (0%, p=0.0002) cough specimens and 13/14 (93%) sputum samples. In normal controls, no bacteria were collected in cough specimens but 4/10 (40%) oral specimens were positive for CFRB. Conclusions: Non-invasive cough aerosol collection may detect lower respiratory pathogens in CF patients, with similar specificity and sensitivity to rates detected by BAL, without contamination by oral CFRB or commensal bacteria. The pathogenic autonomous human parvovirus B19 (B19V) productively infects erythroid progenitor cells (EPCs). Functional similarities between B19V nonstructural protein (NS1), a DNA binding endonuclease, and the Rep proteins of Adeno-Associated Virus (AAV) led us to hypothesize that NS1 may facilitate targeted nicking of the human genome and B19 vDNA integration. We adapted an integration capture sequencing protocol (IC-Seq) to screen B19V infected human CD36+ EPCs for viral integrants, and discovered 40,000 unique B19V integration events distributed throughout the human genome. Computational analysis of integration patterns revealed strong correlations with gene intronic regions, H3K9me3 sites, and the identification of 41 base pair consensus sequence with an octanucleotide core motif. The octanucleotide core has homology to a single region of B19V, adjacent to the P6 promoter TATA box. We present the first direct evidence that B19V infection of erythroid progenitor cells disrupts the human genome and facilitates viral DNA integration. Aim Klebsiella spp. have been stated to be the most frequent cause of neonatal intensive care unit (NICU) outbreaks. We report an outbreak of Klebsiella oxytoca in a NICU at a tertiary care hospital in Norway between April 2016 and April 2017. This study describes the outbreak, infection control measures undertaken and the molecular methods developed. Methods The outbreak prompted detailed epidemiological and microbial investigations, where whole-genome sequencing (WGS) was particularly useful for both genotyping and development of two new K. oxytoca-specific real-time PCR assays. Routine screening of patients, as well as sampling from numerous environmental sites, was performed during the outbreak. A bundle of infection control measures was instigated to control the outbreak, among them strict cohort isolation. Results Five neonates had symptomatic infection, and 17 were found to be asymptomatically colonised. Infections varied in severity from conjunctivitis to a fatal case of pneumonia. A source of the outbreak could not be determined. Conclusion This report describes K. oxytoca as a significant pathogen in a NICU outbreak setting and highlights the importance of developing appropriate microbiological screening methods and implementing strict infection control measures to control the outbreak in a setting where the source could not be identified. While PCR is the most common method used for detecting Bordetella pertussis in the US- most laboratories use insertion sequence 481 (IS481)- which is not specific for B. pertussis, therefore- the relative contribution of other Bordetella species is not understood. The objectives of this study were to evaluate the proportion of other Bordetella spp. misidentified as B. pertussis during a period of increased pertussis incidence- determine the level of agreement in Bordetella species detection between US commercial laboratories and CDC- and assess the relative diagnostic sensitivity of CDC's PCR assay when using a different PCR master mix. Specimens collected between May 2012-2013 were tested at two US commercial laboratories for B. pertussis and B. parapertussis detection. Every fifth specimen positive for IS481 and/or IS1001 with Ct values â‰¤35 was sent to CDC for PCR testing that identifies Bordetella species. Specimens with CDC PCR indeterminate or negative results were tested using an alternate PCR master mix. Of 755 specimens- there was agreement in species identification for 83.4\% (n=630). Of those with different identifications (n=125)- 79.2\% (n=99) were identified as indeterminate B. pertussis at CDC. Overall- 0.66\% (n=5) of the specimens were identified as B. holmesii or B. bronchiseptica at CDC. Of 115 specimens with indeterminate or negative results- 46.1\% (n=53) were B. pertussis positive when tested by an alternate master mix- suggesting possible increase in assay sensitivity. This study demonstrates good agreement between the two US commercial laboratories and CDC and little misidentification of Bordetella species during the 2012 US epidemic.